More from my PhD Exegesis, wherein I consider the ideas of memory at work in Sourdough and Other Stories. I wrote in the Introduction ‘The more I wrote and the more I thought about memory, the more I realised that I was not simply working with ideas of everyday memories – personal histories and the things we know we know – but something more. The stories I was creating were also portals for the reader – standing as analogues not for voluntary memories (the details we are easily able to call up on demand) but for involuntary memories. The involuntary memory disrupts the flow of the durée and the story-tile was intended to do the same: act as a fictional analogue of the involuntary memory, pulling the reader through time to a place that was both past and present, and into a space where other memory relationships were examined. Each story in Sourdough is intended to resemble Salaman’s ‘scenes lit up by sheets of summer lightning’ to simulate the same feeling as those involuntary memories that strike like lightning, seemingly coming out of nowhere. I wanted the reader to feel that each of the stories ‘picks at the stitches of [their] memory’, the way sights, sounds, scents do for the characters in my stories. But I also realised that I also had other ideas about memory operating in the back of my mind, broader in scope and kind. Those ideas involved bigger picture theories, theories about collective memory and communicative memory, about belonging to groups and how being removed from the foregoing might affect an individual, and how this might be captured in fairy tale characters. As I have said, fairy tale children are often abandoned, stolen or lost – “Hansel and Gretel”,” Thumbelina”, “The Snow Queen”, “The Pied Piper” and “Rapunzel” are but a few examples. These child characters would, in the realm of real life possibilities and fears, experience traumas that continue to stay in the mind either consciously or otherwise. They are also removed from their familial or communal group – and from the collective memories as Maurice Halbwachs defines them (i.e. the collection of memories held in common by a group/community) that are attached to that group/community and so form a sense of belonging. In these traditional tales, very little of that trauma of separation and loss of personal and collective memory is addressed, written as they are as morality tales. In writing my Sourdough characters, I was very much aware that the tales were not only about memory, but also about belonging and loss, in which both voluntary and involuntary memories play their part. There was no way of finding out where she had been born or where she came from. She had kept no recollection of her childhood. In piecing together the details she provided covering various periods of her life, one came to suppose that she was born in the north of Europe, probably among the Eskimos, and that she had been transported first to the Antilles and then to France. She said that she had twice crossed large distances by sea, and she appeared moved when shown pictures of huts or boats from Eskimo country, seals, or sugar cane and other products of the Americas. She thought she could recall rather clearly that she had belonged as a slave to a mistress who liked her very much, but that the master, who could not stand her, had sent her away ( 1992, p.37). In sharing this tale, Halbwachs shows that people normally acquire and recall their memories in society – in our social and familial groups ( 1992, p.38). He asks what memories will a child, who is separated from his/her family and taken to a new land where nothing resembles their former life (in essence, passing from a known society to an unknown one), retain? 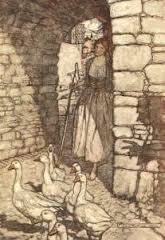 The story of this lost girl seemed to me very similar to one that any number of Sourdough characters might tell: Olwen, orphaned at birth and abandoned a few weeks later; Jessamyn bartered away by her mother to Blodwen and then equally quickly handed over to Archbishop Bigod; Faideau stolen away by the Robber Bridegroom. Sourdough is not only about people being torn from their communities or being outcast – it is also about communities breaking down and dissipating, from large communities to small family groups. Sometimes the disintegration occurs as a result of that one character being removed (for example, in “The Angel Wood” Susannah’s desertion of the family and the wood began the decay of the Woodville dynasty). This idea of belonging and community, their loss and how it affects characters runs through the stories on the smaller screen of memories communicated at the level of teller and listener in the petit sphere encompassed by the characters and actions of Sourdough and Other Stories. Halbwachs’ theories around the importance of social frameworks to the creation and recreation of memory, and Assman’s extension and unpacking of those concepts into the areas of communicative memory and collective memory (1995), are critical to the theme in Sourdough of characters being sundered from their families and social groups and the effect this has on them in terms of repressed memories that return as involuntary memories. Both Halbwachs and Assman have identified the formation and transmission of memory as an essential function of groups – memory is shaped by belonging to a group. Memory, according to Halbwachs, requires others. It is important to note here that what Sourdough interacts with in a fictional sense are ideas around memory, as distinct from ideas around the act of remembering or memorialising (an act of wilful recollection). A natural follow-on from Halbwachs’ work is Assman’s formulation of communicative memory – that memory shaped by our everyday interactions with members of our social groups or frameworks and ‘includes those varieties of collective memory that are based exclusively on everyday communication’ (1995, 126). Bakhtin’s idea that collective memory is embedded in language, narrative and dialogue (1963, p.121), supports the very basis of communicative memory. Groups are bound together by their memories, which are passed on in speech, in telling stories; the quotidian exchange of information about who we are in terms of our family and society is passed on in this way. Children or adults who are set outside the mechanics of communicative memory are excluded from sharing in the collective memory. A sense of belonging is inherent in membership of a group and access to the shared memories of that group. Communicative and collective memory have in common the theme of belonging – the notion that memories are group-dependent. In traditional fairy-tales, characters separated from their families and communities often miss out on this kind of memory – on having the habits and customs and shared memory of their natal group passed on to them. In terms of the Sourdough characters, I have tried to explore what the loss of this sense of group, of belonging, has done to them, how it impacts on their personalities and their later actions – how being unloved has affected them. How have they tried to cope with a sense of isolation – having been outcast, do they attempt to recreate a new social group, a new family? Or do they decide to embrace the loneliness, to throw back out at the world the same ache of aloneness they themselves suffer? Does it make my characters better or worse people? I have acknowledged the importance of these social groupings not merely by showing them taken away from my characters, but also by showing how these outcasts try to build new groups for themselves. Dibblespin, an exile, ‘steals’ a little of the comforts of family by hiding on rooftops and listening at chimneys: ‘… and, if I’m lucky, it’s bedtime stories, fairytales and the like. These are my favourites. I settle in and listen, pretend I have a mother, a father, a grand-dam to lull me to sleep with fables and rhymes’ (p.56); Olwen, that most untethered of creatures, creates her own little pack of the wolf children. The inhabitants of the Golden Lily, all outcasts in one way or another, have gathered together to form a new ‘family’. Where there is a vacuum, my characters have tried to fill it. A child transplanted to a new group would, presumably, learn the communicative memory of that group, through newly established everyday communications. Sourdough, however, is fiction (and, specifically, speculative fiction) and so I speculate via my characters and their actions as to what might happen if discredited memory theories, such as inherited memory, were to operate. What if a character has a memory embedded in their skin, their blood, their DNA? How indelibly marked would they be? These memories carried around inside them, belonging not simply to them, but to their ancestors, act as depth charges that may go off at any time. Ingrid is drawn to the tower, responding to an ancestral lien to the princess-witch. Magdalene’s body finds its own true shape, hidden in the depths of her DNA, merely upon acceptance of who she really is, and no great magic is required. As a fiction writer this kind of idea is a touchstone for my writing – it fires the imagination – it is the very essence of the ‘what if’ question from which all fiction springs. These memories, Salaman’s involuntary memories which come ‘unexpectedly, suddenly, and bring[s] back a past moment accompanied by strong emotions, so that a “then” becomes a ”now” (1970, p.11), will strike at any time, spurred by a smell, a sound, a sight, an occurrence which is substantively similar to the circumstances in which the original memory was laid down. Both Salaman and Proust contend that in that moment of recollection, the memory lives again – the past recurs in the present and the person remembering is thrown back into their own past, for however brief a moment. Indeed, Proust takes it further – saying that ‘The “I” that I once was, and who had disappeared for so long, was now so close to me … I was nobody but that being’ (1992, p.212) – not only are the memory and moment relived, but the once-was person lives again too. These involuntary memories not only interrupt the present, but disrupt the flow of time. In Sourdough, to mirror this I have written the stories with some asynchronous elements. Essentially, the stories appear to proceed along a linear timeline, but there are departures that recreate a sense of being thrown out of time. For example, Dibblespin is a character whose life span stretches across almost a hundred years; she and Emmeline share a father, but the time between the half-sisters’ births is kind of morass where nothing is clear. The king first mentioned in “The Shadow Tree” (first story) is referred to as ‘twice born’ and this links him to Rapunzel’s dead son in the fourth story, making “Little Radish” a story displaced on the timeline and filling in some back story while still having its own independent narrative arc. Patience Sykes appears in “Gallowberries” as a sixteen year old, but by the time she reappears in “Sister, Sister” she is a crone and an enormous part of her life is left a blank. Some details are filled in by flashes, just like an involuntary memory – and just like an involuntary memory, this recreation is imperfect. Not everything can be remembered; blanks exist where information and recollection are simply lost. Not all the Sourdough stories are about being torn away. Some stories are specifically designed to show the idea of ‘return’, of finding the place where your memories reside. In reality, a return to a society from which you were removed will only feel like a ‘return’ if you have actual memories of that place/life from before separation. This is the only way any sense of recognition will occur, if you already have an ‘experience of the specific character that a person derives from belonging to a distinct society and culture’ (Assman, 1995, p.125). But in fiction, there is no law to prevent me from using an idea like inherited or race memory – my fiction allows me to postulate futures and events that are inflected by things both strange and unusual. Such things would be otherwise impossible and which, in any other genre, might cause a reader to be thrown out of the text, to disbelieve. In a fairy tale, there is magic – more importantly, there is an expectation of magic, and I think this in many ways makes the fairy tale the ancestor of speculative fiction. In terms of a perfect marriage of form and content, Sourdough truly belongs in the genre of speculative fiction. My particular fascination with memory centres around the idea of involuntary memory – the memory that cannot be bidden to come, the memory that strikes like lightning, without warning, which makes the memory that comes feel ‘re-lived’, in and out of its own time. This kind of memory fractures times – it can make the dead live again. Indeed Slater remarks that this sensation gives Proust a sense that he was untouched by time (and therefore death), and thus immortal and moved beyond fear (1991, p.3). The power of resurrection lies in the involuntary memory, and like all great powers it is not easily found. It cannot be summoned. How to recreate this in fiction? Catherynne M. Valente’s exquisite two volume The Orphan’s Tales is similar to Sourdough and Other Stories in its use of fairy tales (although is somewhat different in how it moves through time). It uses a frame tale about a young girl in the Sultan’s garden, whose history (not memory) is written in tiny tattooed script around her eyes; each tale is one that makes up part of her history, and each tale is the history of another character. She tells them to the boy who visits her in the garden at night and although within each tale there is a diversion back to a past story, the overarching frame story is always being told ‘in the present’ and the reader never loses sight of the fact that the tale is part of a larger narrative. A major difference between The Orphan’s Tales and Sourdough is that the girl has her history upon her – it is not lost like a memory, it is not something that can only be recovered involuntarily and unexpectedly. Interestingly, she can only tell her history by having an audience, by communicating it in discourse. In holding and telling these stories – these many histories – she is not only a ‘memorial’ for herself, but for others – she is a place where many voices reside, a kind of human heteroglossia (Bakhtin, 1981). When Middendorf interprets Bakhtin’s ideas about language she notes that ‘language connects humans to one another throughout history’ (1998, p.206) – the girl acts as space where myriad voices can connect with each other, and a place where she can connect with her own history. But her history is accessible to her and she acts as her own remembrancer – she deals with the things she knows she knows, which are activated by the presence of an audience. The Orphan’s Tales deal with personal histories, which are accessible to the narrators and this differentiates them from the Sourdough stories, each of which replicates the inchoate pattern and intensity of involuntary memory – something which is not simply recalled at will. As Salaman observes, one of the essential features of memories is their discontinuity (1970, p.5) and with Sourdough’s ‘time fugue’ I believe I have recreated that sense. Salaman describes memories as a ‘transmutation of real experience’ (1970, p.4) but in fiction such experience must be created. Georgian fairy tales often begin with ‘There was and was not…’, which taps directly into the heart of the writing of Sourdough – how to create a fictional memory and make it believable to the reader? How to create something that is and is not? In creating memories for my characters, which are of necessity fictional, I need to make them ‘real’ for my readers. To do this, I must use the tools of both contextual realism and emotional realism. With the former my story must connect with reality and possibility – Henry James said that a ghost story must connect with reality at a hundred points to bring a reader in and convince them of the ‘truth’ of the story – to activate a willing suspension of disbelief (Lustig, 1994, p.50). One of the advantages of using the fairy tale is that the form itself with its tropes and motifs are recognisable to most readers. To see the words ‘once upon a time’ flags a particular kind of experience. A fairy tale is also set, to some extent, in a world that a reader recognises even though it is not of our time – but it is still set in an idea of our ‘medieval past’, so it is not completely unfamiliar. A castle, a forest, a village – these are all settings and contexts that anchor readers in something they at least partially recognise. Engaging a reader this way allows a writer to induce the reader to believe. But I am also trying to create something that feels like an involuntary memory – the kind of memory that reactivates emotions and sensations, that makes these once-felt things live again – so it is not enough to simply give readers a setting they recognise. To create a story that acts as an involuntary memory I need to make the reader feel something. I need the story to activate emotions in the reader that they have felt before and re-recognise. ‘Pulling at heart strings’ is a crude phrase, but that is a version of what I am trying to do. If a reader cannot empathise with a character, then they will not be engaged and they will not believe. If I cannot move the reader I will not be able to access what Freud nominates as a ‘peculiarly directive power’ in order to ‘guide the current of … emotions’ (1997, p.228). As a writer I want to take readers on a journey with me. If I can make a reader feel for my characters, then no matter what a character does, while the reader may not agree with her/his actions, they will hopefully understand the character and why s/he has acted in a particular way. I think of it as bringing the sunken ships of involuntary memories to the surface. A.E. Housman in The Name and Nature of Poetry says: ‘And I think that to transfer emotion not to transmit thought but to set up in the reader’s sense a vibration corresponding to what was felt by the writer – is the peculiar function of poetry’ (1933, p.12) and this can be applied equally well to prose. This striking a chord, this setting up an emotional vibration within a reader is the most valuable effect I can hope to achieve in order to create a fictional analogue of an involuntary memory. Leaska observes that ‘A tale conceived in a particular way has certain affective potentialities over a reader’s feelings and attitudes … how the tale is presented to the reader will determine whether those affective potentialities either become vivid or remain lifeless on the page’ (1996, p.159). In order to enhance the chances of engaging a reader’s empathy – indeed to help evoke a sense of memory – I used first person narrators for each story. The use of the ‘I’ makes the stories personal and more intimate and, coupled with the use of the present tense, very much more immediate. The Orphan’s Tales do not use first person narrators – they are written in third person as well as in past tense. Particularly in the latter case, this lends to the effect of reading a history, something which happened in the past – in the case of the former, it lends to the sense of being told a story. In both cases, it means that the tale loses immediacy and loses personalisation. The reader cannot feel as though s/he can become the ‘I’ of the tale and therefore the opportunity to embed the reader in the story – the critical effect I am after – is missed. In Sourdough, the narrators exist inside the world of the events, they narrate their own tales ? they are, as Genette says, narrators ‘in the first degree’ (1980, p.248). They are homodiegetic, characters within their stories, who tell these stories while being involved in them. The first person perspective gives the reader a first-hand ‘participation’ in the character’s experiences. By involving a reader in this way, by making them empathise with a narrator’s plight, to have them feel as though they are living the narrator’s highs, lows, fear and hopes, I am not simply telling them a tale. I am attempting to put the reader inside the tale – inside the narrator’s head and heart. If I am able to do this then I not only engage the reader in the idea of a recreated memory, but I also engage them in the sensations of loss – of family, love and community – at the heart of the Sourdough stories. The themes of belonging and exile are universal. Everyone has experienced to some degree the common warmth of belonging and the cold pain of being cast out. Salaman says, quite beautifully, that we are ‘all exiles from our past’ (1970, p.16). The memories I am recreating in fictional milieu those that lie dormant until triggered, and if I can recreate similar sensations – or a version of them – in a reader as those they themselves experience when an involuntary memory overwhelms them, then I have achieved my goal as a writer. Communities and memory help bind people together. What happens, then, when someone is either removed from or denied entry into a social group? What happens to their memories of the time before? What happens when old memories, traumatic memories lie in the unconscious, waiting for an inciting moment? I knew that creating a version of an involuntary memory would not simply lie in the engagement of the reader’s empathy. I knew I needed to couple this with a structure that replicated memory itself – a structure that, in effect, mirrored Proust’s ‘a collection of moments’. A short story collection had some advantages, but as each story is final and set they would lack the sense of connection required to create the feeling of oneness, of wholeness, of community, that I wanted to tie my tales together. A traditional novel would give the sense of oneness, but would require all mysteries to be solved – and Sourdough was never intended to be a ‘tapestry’, with all its threads tied tightly into the warp and weft of the design. Sourdough was always meant to represent the ragged edges of memory. The answer lay in the structure – in using elements of the short story and the novel to create something neither one nor the other, but hopefully stronger than both. Crafting the mosaic will be considered in the next section. This entry was posted in fairy tales, On Writing: General and tagged Catherynne M Valente, esther salaman, fairy tales, phd, proust, sourdough and other stories. Bookmark the permalink.